A mountain cabin, whether it’s tucked away deep in the woods or located close to town, provides a wonderful opportunity to relax and enjoy being close to nature. A cabin is also a great canvas for showing off your decorating skills. Whether you go traditional or contemporary, decorating your mountain cabin can turn a simple building into your own cozy retreat. Your cabin may already have wood on the walls and floors, and if so you probably won’t want to alter them. But if you have any painted walls, you can add some fresh light, neutral, nature-inspired paint in colors like sage green, light rust or beige. The neutral paints are a nice contrast to any wood in the room and lighten up the space while highlighting the wood’s natural beauty. For wood floors, add some warmth with cozy area rugs. Again, neutral, solid colors or simple rustic designs work best with cabin decor. For a traditional look, mountain cabins call out for leather or other practical upholstery materials. Even if you decide on more modern options, go for couches, chairs and other pieces without sharp edges, using the rounded, smooth frames and sides to create a timeless impression of worn comfort. Continue the use of earth tones for a natural look. You can also add some wicker seating or tables to avoid too much heaviness. In the bedrooms, create a traditional retreat feel with wood or iron. Bunk beds are always a hit in a cabin, and can provide more sleeping room for guests. Too many neutrals can be boring, so add occasional pops of color using fabric, pottery and wall art. Consider traditional tartans and buffalo plaids, especially in reds. Use cozy blankets or throws for more splashes of color and to soften the impact of leather and wood furniture. In bedrooms, white spreads can balance out any dark wood or metal in the cabin. If you want a more muted color, dusty blue can be a great accent color for counters or cabinets. In a cabin you can have fun with accessories that might not fit in other types of homes. Add some kitsch without going tacky by using antlers to hold back curtains. Make candle holders from large industrial thread spindles. Display nature-themed art on the walls and tables. Create your own art by framing fall leaves or stenciling designs onto lampshades with acrylic paints. Instead of tucking your winter gear into a closet, store sleds, snowshoes, skis or fishing gear by hanging it on the walls for display, turning it into part of your home decor. The most important thing is to have fun and create a space where you feel comfortable and will enjoy spending time. At our shop in Frisco, Colorado we can help you find the finishing touches for your mountain cabin. 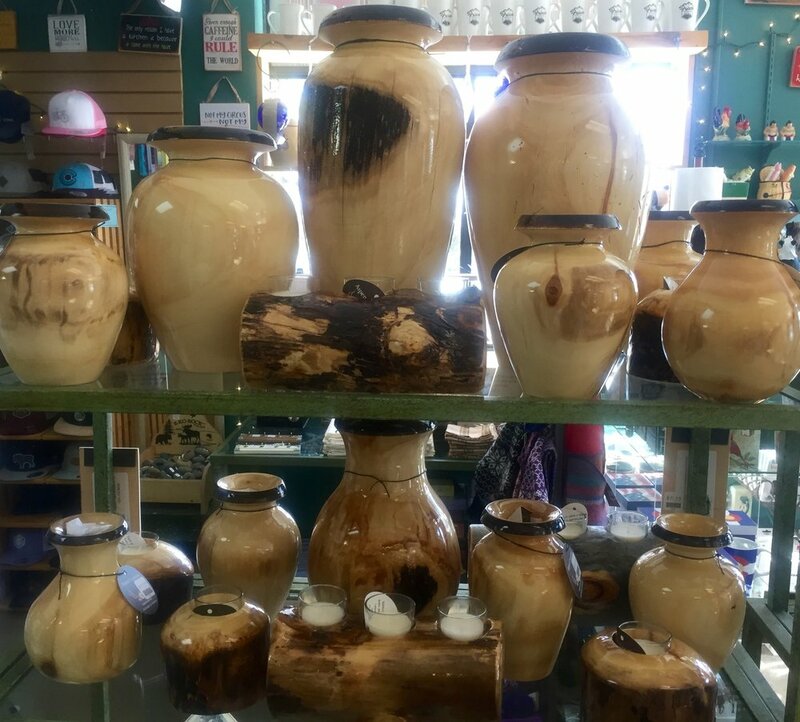 We carry a variety of items such as picture frames, aspen wood vases, rustic signs, dish towels, pottery, coasters and lots of mugs and glasses to put into your cabinets. We can also direct you to some great local spots for used and new furniture and other accessories you might need! Add some color and character to your kitchen with our fun dishtowels! You've bought your dream home in the Rocky Mountains. It is a blank slate awaiting your own personal design to turn it into the ultimate mountain retreat. You don't have to be a professional interior designer to make your house into a home. Here are some great tips for decorating your mountain home. Begin with the outside of your home, because first impressions are so important. Dress up the front porch with some rocking chairs and a table. Add a porch swing. Choose a wreath to place on the door that reflects your personality and invites visitors to come on in. For a finishing touch, add some greenery that can survive the cold winters. Not sure where to even begin on the interior design? Try looking at thought-provoking ideas on Pinterest or Houzz. There you can see rooms that you like and use them as a reference point for your shopping trips. Visit some local artists or shops and choose an inspiration piece that you love--maybe a painting, statue, or piece of furniture. Design your room around the colors and style of the element you chose. Inspiration can also be found outdoors in the beauty of nature that surrounds your new residence. You want your home decor to be pleasing to the eye, but the most important aspect is that it is comfortable. It is not enjoyable for you or your guests to have furniture that is stunning if sitting on it is like resting on concrete. Test every potential purchase before buying. Sit on the chairs and couches, take a spin on the bar stools, take your shoes off and walk across the rugs, and open the packages to feel the bedding before investing in the linens. People may look at you strangely while you are shopping, but that moment of discomfort will pay off in the long run. At the end of the day, trends and the latest styles do not matter. Your mountain home should be a reflection of you and a haven that you can't wait to return home to every night. Happy autumn! What a wonderful time of year it is for amping up your home decor. Whether your condo is a well-deserved vacation retreat, a weekend hideaway, or your permanent residence, the upcoming holidays warrant a little seasonal flair. These Mixture Candles make a simple statement. They're made with 100% soy wax, and they smell absolutely amazing. The next few months are all about color, comfort and childhood memories. This is the time of year most people begin to think about holiday decorations. With strategic planning and a little creativity, you can have a classy look that will take you straight into the new year. Here are a few suggestions that add some flair with little investment. Simple is always classic and beautiful - keep it classy, keep it natural and keep it fresh. Concentrate on just one or two areas and create small vistas, or focal points of interest. Begin with some basics, then embellish. A classically set dining table gives your home a welcoming feel. Use gold chargers and simple white china. Crystal candlesticks and a large clear vase are all you need for the beginnings of several distinct looks. In November, cinnamon colored cloth napkins and candles add the pop of color. Scout out the thrift stores for an old cable knit sweater in a warm honey tone. Cut off the sleeves and slip one over the vase; then fill it with branches of colorful leaves. Flank the centerpiece with small pumpkins. In December, use deep green napkins tied with red ribbons, or use rustic napkin rings. Place a glass filled with Christmas tree branches inside the large vase. Fill the space between the branches with peppermint candy. Use a white permanent marker to stripe red candles and add a few small wrapped gifts to the tablescape. A mantle or an entryway table is an area where you can let your imagination run wild. A small red wagon filled with apples and a jar of candy corn is perfect for November. In December, layer it with classic children's holiday storybooks and a few stuffed teddy bears. Timeless holiday decor for small spaces doesn't need to be expensive or labor intensive. Just think simple. If you're looking for some candles, napkin rings, or the perfect item for your focal point, visit our gift shop for some simple and unique ideas. Print out that awesome picture and frame it for your mountain home. Decorating your home is a wonderful opportunity to share a little piece of yourself with your friends and family who are guests in your home. When someone steps into your home they should be able to see a little of your passion and style. Decorating a second home gives you more freedom to explore themes and dabble with creative design choices that you might not risk in your primary residence. A vacation home should be full of the mirth and memories that you have created in your stays there. When you are decorating your second home in Colorado, take your time. Don't feel like the entire house needs to be decorated from the start. Set a goal to only add decorative elements to your vacation home that have meaning for you. Buy items as you go. Each time you visit your vacation home, pick up a decorative item as part of your adventures. Then, every time you see that particular mirror, frame, or piece of pottery, you will remember the day you spent enjoying the Colorado mountains and the joy you felt when you happened upon that particular item that would grace your walls or sit on your countertop. As your second home shifts from sparse to fully-decorated, you will be able to reflect on all the time you have spent there and the way your life has also become more full as a result of this beautiful oasis you are creating. If you have children, let them be part of the experience by asking them to keep an eye out for fun items for your vacation home while you are out and about. Find some local stores that you love and can visit together every time you stay in your vacation home. Your children will love the tradition you build as a family and look forward to finding a home item together each trip. Instead of a matching set of dishes, find a variety of coffee mugs and pottery for an eclectic collection that you can add to each time you visit. After doing an activity such as floating on a river, skiing or horseback riding, buy art that somehow features that activity or the setting where it took place. When you spot some wildlife, buy a decoration or item featuring the animal you saw. If you take an incredible photo, buy a frame that same day. Frisco has a number of shops with great decorations and inspiration for your mountain retreat, including new and used furniture, antiques, framed photography, dishes and home decor. At Frisco Fun & Formal, we've got all kinds of great smaller items to furnish your home, including frames, glassware, pottery, linens, wall hangings, candles, wine stoppers and charms...and a vast selection of coffee mugs!